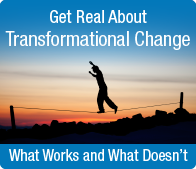 Download the free eBook on "Get Real About Transformational Change: What Works...What Doesn't." In addition to listing the Top 10 reasons why transformational change efforts fail, the eBook describes the 4 fundamental requirements for successful transformational change. The common pitfalls for transformational change that sound good but don't work!